Tinto Rey is Matchbook Wine Company’s brand that focuses on Spanish varietals and Spanish style wines. To learn more about Matchbook, one of my favorite wineries, you can read all about their great story in my article “A Brief History of Matchbook Wine Company”. The Tinto Rey Verdejo 2017 is 89% Verdejo (from a half-acre vineyard at the entrance of Matchbook’s winery that was planted in 2012) and 11% Chardonnay. It was hand harvested, stainless steel and barrel fermented, saw five months of aging on the lees in neutral French oak, and has an ABV of 12.%. 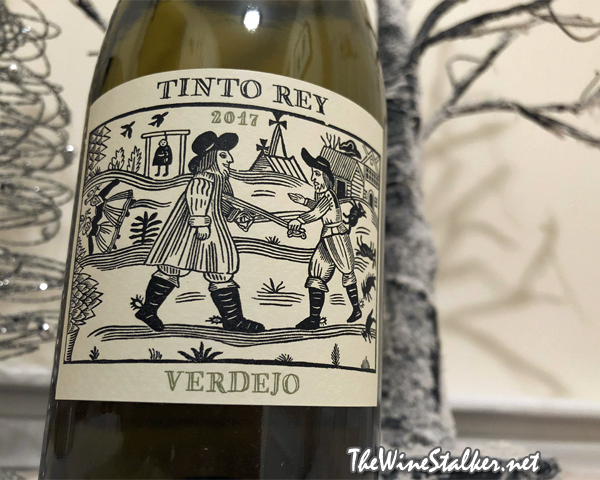 I reviewed the Tinto Rey Verdejo 2015 back in 2016, and that one was 100% Verdejo will all of it being barrel fermented. I love the Tinto Rey label. Two Spaniards running each other through, a dead guy hanging from a noose, I don’t know what’s up with those ladies but they could be dead and birds are eating their faces, and cute little doggies or goats or bunnies or whatever rolling around in the field (or they’re dead). Now that’s how you make a label! Take note! Just like the 2015 vintage, the wine is vegetable oil in color. On the nose this is much more floral and far less flinty. There’s aromas of peaches, pears, orange peel, and honeysuckle. It has a medium body with a creamy mouthfeel and an uplifting but restrained acidity. There’s flavors of peaches, pears, and kiwi. Then it finishes with kiwi and a little oak. Verdejo is the varietal I immediately think of when somebody starts talking about pairing wine with chicken. Verdejo is great with any kind of poultry, honestly, but especially chicken. Especially especially herb rubbed chicken. And yeah, this would be great with that. But, like the 2015 vintage, it’s an excellent alternative to Chardonnay or Muscadet.